Trees offer many advantages to a garden – you can use them to help define spaces, mark a boundary, or provide shade (along with many other uses). Trees can also mark the seasons, with foliage that changes hue throughout the year and finishes with a spectacular blaze of color in fall. 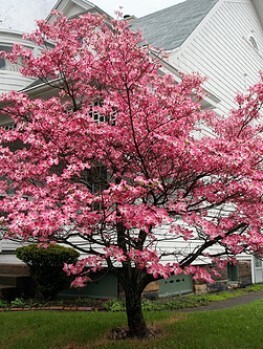 Many also produce impressive displays of flowers in spring or early summer, and flowering trees are always a popular option with gardeners. 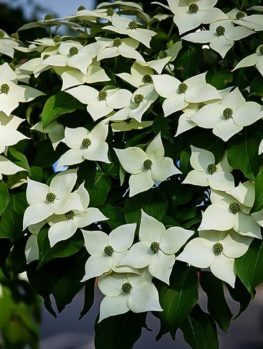 If your space is limited, then the flowering Dogwood (Cornus florida) is an ideal option that won’t grow overwhelmingly large, and the Cloud 9 is a particularly attractive variety of it. 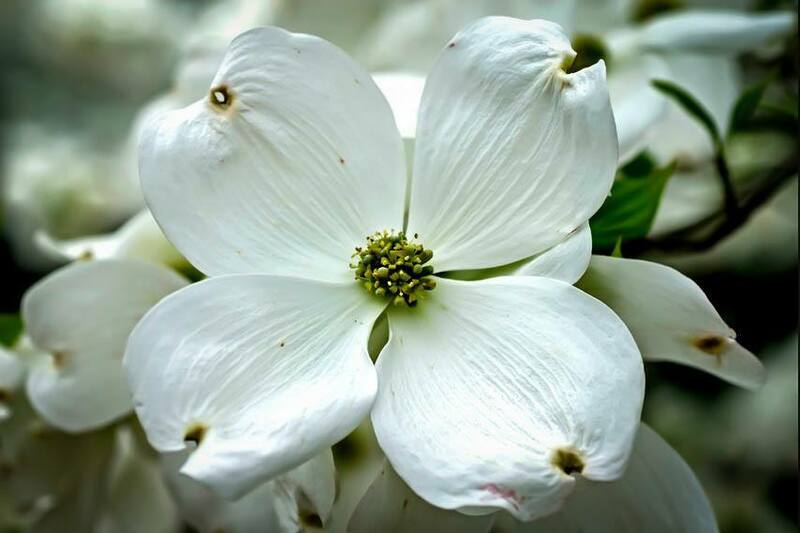 Flowering Dogwood is a native American tree, found all the way down the East Coast from Ontario to Mexico. It’s tolerant of climate and blends in well with other native species. 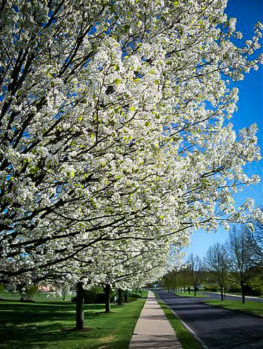 Its beauty begins to appear early in the year with an impressive display of blooms in spring. The actual flowers are tiny and appear in bright yellow clusters up to an inch wide, but each cluster is surrounded by four yellow-white petal-like bracts, which open out flat to give the appearance of large flowers around three inches across. Later in the year the Dogwood grows a crop of bright red berries; these are bitter and inedible to humans but for birds they’re an important food source. 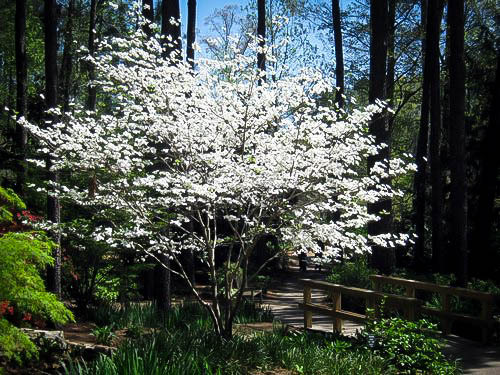 Cloud 9 is one of the most attractive varieties of Dogwood, which usually grows to around 15 feet tall but can reach as high as 30 and is usually about as wide as it is tall. It tends to take on a slightly conical or pyramidal shape. While the lower branches are usually too low for it to make a good shade tree it can provide shade for shrubs or flowers planted around it. 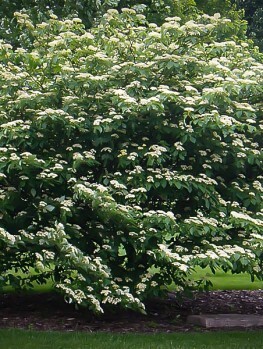 Compared to other Cornus florida varieties, the Cloud 9 blooms very early, getting your garden off to a flying start after the winter. 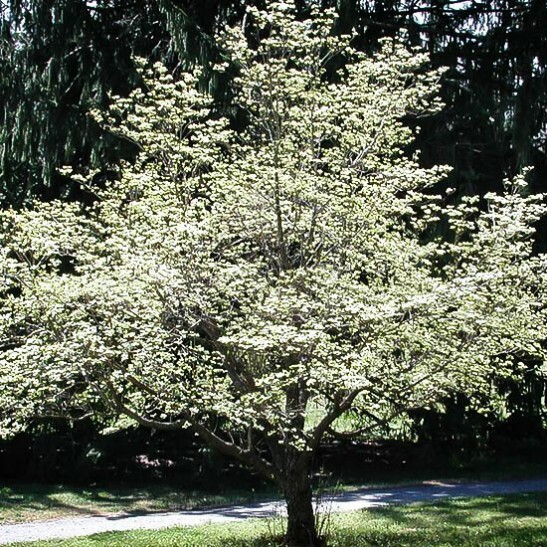 The flowers will be at their height from mid-April to mid-May, and this Dogwood has a particularly rich crop; at the height of its bloom the tree’s appearance is completely dominated by them. When the fruit appears in late summer it’s just as plentiful, and its bright red color gives the tree a new, rich appearance. As fall closes in the foliage turns a particularly beautiful red with a strong hint of rust, making for one final display before winter arrives. Able to thrive in plant hardiness zones 5 through 9, the Cloud 9 is suitable for almost anywhere in the continental USA apart from Alaska and the extreme northern parts of New England and the Midwest. However it’s not suitable for areas with dry ground; it does much better in moist but well-drained soil, especially if it’s slightly acidic and organically rich. If your own soil is slightly borderline dig in a generous helping of peat moss before planting your Dogwood; that will help give it an environment it’s happy with. To help keep its roots moist in summer apply a four inch layer of organic mulch around the base of the tree, and if rainfall is sparse make sure the mulch is well watered. 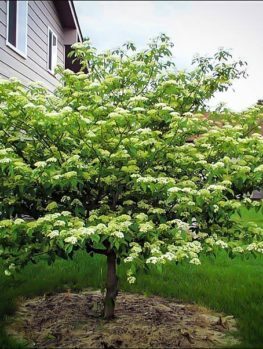 The ideal location to plant a Dogwood will have sun in the morning and shade in the afternoon, but as long as the roots stay moist enough it will also tolerate full sun well. 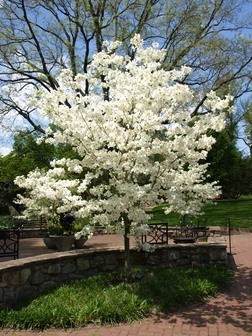 Not all Dogwoods tolerate very cold weather too well but Cloud 9 is a particularly hardy one, and specimens have thrived in zone 5b for 30 years or more. 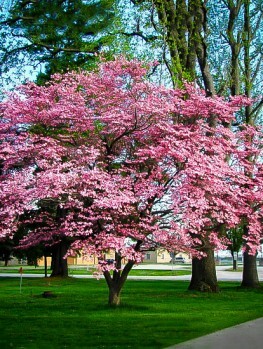 In general the Dogwood is a robust tree, but there is one thing you should look out for. 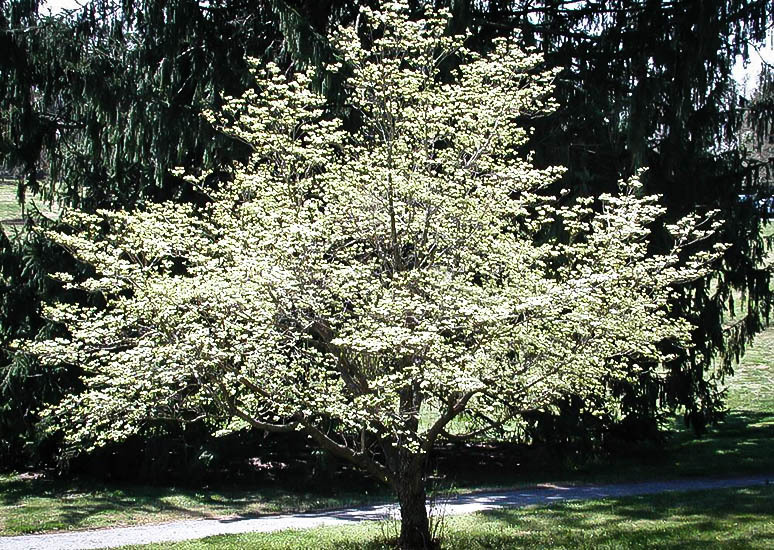 It becomes vulnerable to a number of diseases when stressed, and the worst of these by far is Dogwood Anthracnose. This has become a serious problem in parts of the eastern USA, although it’s much less common outside the Dogwood’s native range. Powdery mildew, root rot, canker, leaf spot and leaf and twig blight are other potential problems. Parasites include borers, although leaf borers and scale are less of an issue. To avoid stressing the tree makes sure the soil is well prepared before planting, and once it’s established be careful to avoid damaging the trunk – mowers are a common cause of this. If Anthracnose is an issue in your area it may be worth considering an alternative species. Once your Cloud 9 is established you’ll find it becomes a natural centerpiece in your garden. From spring through to fall it’s a vivid, eye-catching tree, and it will also become the keystone of a busy ecosystem. Butterflies, as well as bees and other beneficial insects, are drawn to its plentiful flowers. When the berries ripen they will attract a wide range of birds. Robins, catbirds, mourning doves and may others rely on the Dogwood as an important source of food in fall. 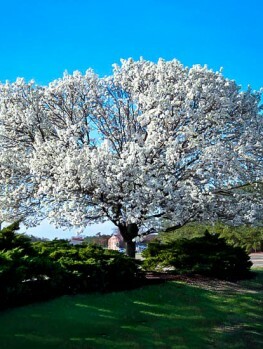 We sell only Cloud 9 trees that conform to the normal shape and are in good health. With good site selection and some simple preparation of the soil you can rely on our saplings growing into stunning trees that will enhance your garden for decades to come.